16 Nov 2018 --- High school students participating in school meal programs are less likely to select milk, whole fruit and water when fruit juice is available, which on balance may decrease the nutritional quality of their lunches, according to a new study by the Rudd Center for Food Policy and Obesity at the University of Connecticut. “Our findings suggest that on the days when juice is available as a choice in high school lunches, students do not select whole fruit and milk as often. 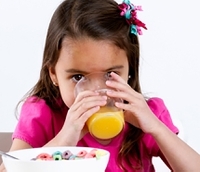 This is a problem because compared to juice, milk and whole fruit are better sources of three nutrients of concern for adolescents – calcium, vitamin D and fiber,” says Marlene Schwartz, Director of the UConn Rudd Center and co-author of the study. The study, published in the Journal of Nutrition Education and Behavior, utilized cafeteria register data from three low-income, Northeast high schools over one school year to determine whether high school students select different meal options on days when juice is available. The study also looked at the sales of a la carte beverages, which include both water and 100 percent fruit juice. The study found that on “juice days,” nearly 10 percent fewer milks and 7 percent whole fruit servings were selected with lunches. It also noted that 8 percent fewer bottles of water and 24 percent fewer bottles of 100 percent juice were sold a la carte when juice was offered. “The potential nutritional impact of these substitutions is important to consider. For instance, an 8-ounce serving of apple juice has no vitamin D, 285 fewer grams of calcium, and 116 fewer grams of potassium compared to an 8-ounce serving of 1 percent milk,” says Rebecca Boehm, lead author of the study and a University of Connecticut Postdoctoral Fellow with the Rudd Center for Food Policy and Obesity and the Zwick Center for Food and Resource Policy. The National School Lunch program reaches over 30 million students. Currently, the American Academy of Pediatrics recommends that children aged 7-18 consume no more than 8 ounces of juice daily and juice is permitted to be served as part of the National School Lunch program only on certain days. Other studies have investigated methods that could increase the fruit and vegetable intake of students. A University of Warwick study found that among university students, moving the location of fruit and vegetables in the campus store led to a 15 percent sales increase of the nutritious products.